I’m a snack person. My kids are snack people. Maybe it’s an “apple not falling far from the tree” situation, or maybe it’s just because snacks are awesome. Maybe it’s both. Snacking can get a bad rap. Too sweet, too salty, too fried, or just too much. But, it doesn’t have to be that way. Snacking between meals can keep you fueled through the afternoon slump and help curb over-eating at meal time. It all starts with picking the right snacks, and naturally I have a few ideas to share! Inspiration for these snacks start with Simple Truth products, available at Harris Teeter. All Simple Truth products are minimally processed and free from artificial ingredients. The Simple Truth Organics label provides an organic option which I feel good about serving my family. 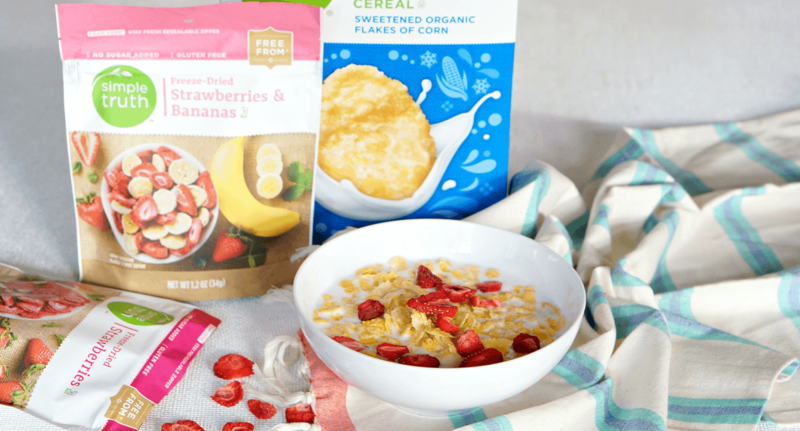 Not only are Simple Truth products a healthier option for my family, but I am also able to give back to my children's schools through Harris Teeter's Together in Education program when I purchase Simple Truth products. Ready to get snacking? Me too! It’s time to elevate snack time with these five Simple Truth recipes. My kids love anything in “pop” form. Applesauce is no exception. With a perfect almost ‘slushy’ texture, you may find you love these as much as your kids! To make these Applesauce Pops, pour Simple Truth Organic Unsweetened Applesauce into popsicle molds. Freeze until solid. To release from the molds, run under hot water for a few seconds. Sometimes it’s all in how you sell it. My kids love having cereal for a snack, but then again so do I. What makes it even better is adding freeze-dried fruits to their favorite cereal. They think it’s candy, and I don’t blame them. Simply sprinkle Simple Truth Freeze-Dried Strawberries over your favorite Simple Truth cereal and pour on the milk. We also use freeze dried fruits with oatmeal and yogurt to upgrade our breakfasts. Popcorn is a great low-calorie snack, and you can find Simple Truth Organic Popcorn in both family-sized bags or individual portions. To make popcorn more satiating, try adding a sprinkling of Simple Truth Organic Peanut Powder. If you’ve got a sweet tooth, you may also like the Simple Truth Organic Chocolate Peanut Powder. For the right peanut powder to popcorn ratio, add three tablespoons of peanut powder to a 4.5 ounce package of Simple Truth popcorn. Fold over the top of the bag to seal and give the popcorn a good shake. Pour into a large bowl and enjoy! 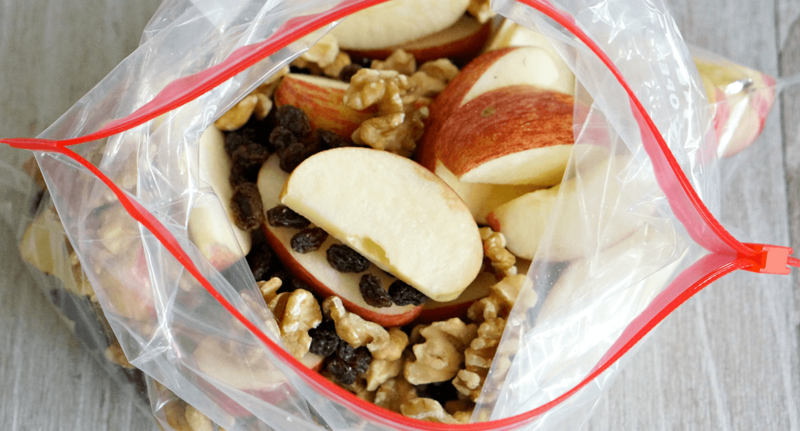 This treat is my favorite way to pack up apples for a road trip or in the kids’ lunch box. The cinnamon coating keeps the apples from turning brown! Slice and core 3-4 medium Simple Truth Honeycrisp apples and add them to a gallon-sized storage bag. Toss in a handful of Simple Truth raisins and another handful of walnuts. Sprinkle 1 teaspoon of cinnamon per apple over top. Shake to coat the apples and refrigerate until ready to serve. Need a post-workout snack sure to satisfy? This combination of Simple Truth jerky, dried fruit and nuts does the trick. Chop 1 package (2.5 ounces) of Simple Truth beef jerky and 2.5 ounces of Simple Truth Dried Mango. Combine this with ½ cup of Harris Teeter Organic Dried Cranberries, ½ cup of Harris Teeter Organic Raw Almonds, and ¼ cup sunflower seeds. Store in an airtight container until ready to enjoy.